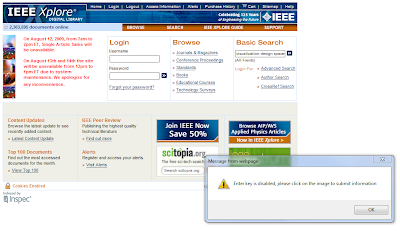 It's a sad day when the IEEE website makes it into my collection of 'infovis and usability pitfalls'. I've been saving a collection to use as icebreakers at the beginning of HCI classes I will teach. Today's instalment, courtesy of my own professional organization, is an arbitrary warning to 'please click the image' instead of pressing enter. Issues with this of course include the fact that pressing [Enter] in search forms is the standard, assumed behaviour. Secondarily, there is the annoying popup box -- obviously the system knew I pressed [Enter], why give me an irritating message instead of just activating the darn search? Finally, this message ("Enter key is disabled, please click on the image to submit information") is infuriating as it offers no logical explanation as to why the key is disabled, making it seem like an arbitrary inconvenience. It also is not grammatical and does not end with any punctuation, making sticklers like me cringe. HCI 101: Write clear error messages. These sorts of inconveniences seem minor on an individual basis, but I'd love to see the logs and know how many times a day this message is displayed. It's not even like this will be an easy-to-learn interaction technique, as it is (a) much slower than pressing [Enter] and (b) goes against the accepted conventions (my 'mental model' of how the web works). It's shameful that an organization that hosts conferences on usability would create an interface like this. What's worse, I had to use Internet Explorer even to get this error message! In Firefox, my preferred browser, pressing [Enter] simply reloads the page with no apparent effect. No error, no search results. Just a reload. Hmmm, isn't the IEEE an advocate for web standards? Posted by Christopher Collins at 1:30 a.m.